First floor bed rooms for the ones who don't like stairs. 2 bed rooms are in the main floor and 3 bed rooms are in upstairs. Each bed room has own TV and total of 7 TVs in the house. All your worries behind and run off to a relaxing getaway in the Poconos. 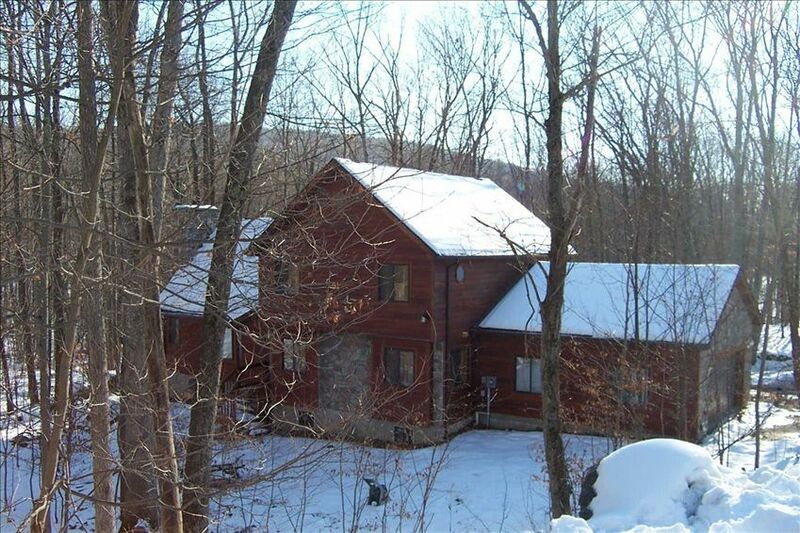 An 1 1/2 hour from NYC, this cedar and stone house has five bedrooms, and 3 full baths. It is fully equipped kitchen and a washer and dryer in the basement. WiFi is available. It features 1 King size bed, 2 queen size beds, 4 full size beds and 1 twin bed (sleeps 12- 14 comfortably with a maximum of 14).Bring your own linens and towels.Please take them back with you to wash them at home. There is a stone fireplace running all the way to the top of the cathedral ceiling and a large deck outside for your enjoyment. Recently the Mt. Airy casino has opened within 20 minutes of our house for your enjoyment. The house is located within easy driving distance of the Delaware River (Delaware Water Gap) and Shawnee Lake and there are canoes and rafting/tubing available for rent along the river. Other activities nearby include hiking, biking, horseback riding, tennis, basket ball. swimming,skiing is across the street at the Shawnee mountain and the area boasts some of the largest golf courses in the Poconos. You also have access to a community spa, pool and health club, although the house has it's own private jacuzzi. The owners speak English, Japanese and German. I was born in Tokyo Japan. I met my husband when I was studying in Germany at the same university. My husband used to come here for golfing since he was attending Fordham University in NY. Our favor vacation place has been always Poconos. Finally we decided to build one instead of renting. That how we got this beautiful comfortable house here in Shawnee. Most of guests enjoyed that we have 2 living rooms( one we call a family room or den), as their children could watch own TV shows although each bed room has a TV or playing games etc.. while the adults enjoyed chatting with family or friends or watch their own show. Also, they liked the idea of having 2 bed rooms and a full bath on the 1st floor as some times they had older people who do not like stairs. Also the guests like to have a TV in each room. Wd have total of 7 TVs in the house. This is amenity filled vacation community, such as indoor , out door pool. ski slope is a few minutes walk ( 33% off on your lift tickets for our guests ) 27 holes golf course (55% off on your green fee for our guests).the pools are free of use, as same as tennis court, basket ball court, horse shoes.valley ball court etc. our guests also enjoy, canoeing, rafting at Delaware River( also discounts available) Near to grocery stores, restaurants,movies and Casinos etc..
central air conditioning and heating. two zone system with separate thermostat for first and second floor. Shawnee ski mountain is a few minutes walk from our vacation house. at Sun Mountain club..We provide member ship passes to get in. Free of use. Discount on Green fee. 27 holes, nice view. To get in first floor, you can do that without steps, however we are not equipped for handicapped person such as bath rooms, kitchen etc..
we have indoor and out door pool and a large jaccuzi which seats 16 people is by the indoor pool. Janice and friends. Thank you for staying at our vacation house. you were well behaved guests, nice to have you ! Have a wonderful summer and come back again !! This is our family’s 9th year here. The home is perfect for family get togethers, really any large group. It’s spacious, open floor plan makes everything comfortable yet cozy. The beautiful fireplace warms the whole atmosphere. So close to Shawnee ski mountain that you could walk there. The owner responded within minutes to the one question I had. Kitchen has everything you will need along with new appliances. Plenty of parking, even two garage bays. Saw deer every day. Churches, any kind of shopping, dining, tourism and entertainment is close by. Minisink Hotel still our favorite but recently found Pub 447 has great steaks and seafood. Welcome back again and again for 9 times. You have been such wonderful guests. If something goes wrong in the house , you fix it before repairman is called. We have a lots of good memory about you. God bless you and your family ! This is an ideal house for anyone with a large family. 2 rooms to watch tv. Big dining area for board games and cards. House is clean and always kept up. Master shower needs some new hardware for shower. Tv in main living room needs to be about 40 inches bigger tough to watch a football game or hockey Olympic game on that size tv and distance. But those are the little things. Skiing right across street all stores 2-4 miles away can’t beat this place. Owners are there for you all the time. Thanks again for coming back. So many years. We appreciate it. The shower room will be fixed by the time you come back. Have a wonderful 2019 !! Great place for a group. Lived-in but nice, good layout and great value for a group to hang out. Bob and Kay checked in a few times to make sure everything was OK. They seem like very nice folks. We had a group of 14, 5 family units, and were comfortable. The main living area is an open space, with a couple large tables, roomy kitchen, and living area where we could all spread. The wood burning fireplace was cozy. There is another small reading/tv room on the other side of the house if anyone wanted to get away. The kitchen was fine, plenty of utensils, dishes, etc. The house is not pristine, it has had a nice life and shows a little age, but is taken care of and comfortable. Light sleepers might not want the large first floor bedroom, but the rest of the house was quiet, especially upstairs. The nieghborhood is nice, quiet, we had a couple good walks around. The ski resort is a long walk or short drive,good for first-timers. The pool is about 10 minutes away at a resort, but worth the drive. Easy access,clean, with a large hot tub. In the surrounding area there are plenty of outdoor hiking opportunities. There are ample shopping options in the area for stocking up. In town, there is the Deer Head Inn - a random special find, live jazz, a dear (no pun intended) spot to hang out, but only open half the week. We really enjoyed our stay. Not luxurious but we didn't want for anything. A great place to hang out with extended family. Overall I really liked the place. There was plenty of space and beds to accommodate the number of guests the place is advertised to hold. Only complaint was there were a few areas of the house that were a little dusty but it wasn't bad enough to detract from the experience. Call for any questions about the price at 410-322-9605 Kay. We will be reasonable.